Green Mountain Project performs Monteverdi’s “Vespro della Beata Vergine” at St. Paul Church on Saturday. CAMBRIDGE — Claudio Monteverdi’s “Vespro della Beata Vergine” of 1610 has been called his “secular contribution to sacred music.” To the five psalms, the Marian hymn “Ave maris stella,” and the Magnificat of the standard Vespers, Monteverdi added four motets to texts drawn from, among other sources, the Song of Solomon. The result is a full-blooded love song to the Virgin Mary, and Saturday evening at St. Paul Church in Harvard Square, it got a full-blooded reading from Green Mountain Project. Named after the English translation of the composer’s name, Green Mountain Project draws its performers from the New York–based Tenet and the Boston-based Blue Heron. 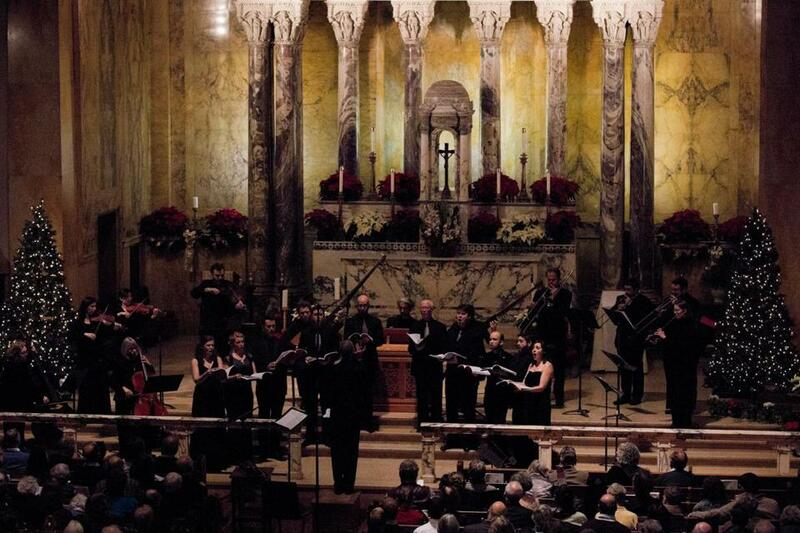 The group made its debut in New York with this same work in January 2010; it made its Boston-area debut a year ago at St. Paul Church with a Monteverdi “Vespers of 1640.” Blue Heron director Scott Metcalfe led from the podium when he wasn’t directing from the violin section; Tenet director Jolle Greenleaf was among the sopranos. The 14 singers and 14 instrumentalists huddled in St. Paul’s sanctuary, but they were constantly changing formation. The cornetti and sackbuts started out stage left; then the cornetti moved stage right, to create an antiphonal effect; then the instruments divided, so there were cornetti and sackbuts both left and right. The group singing the plainchant antiphons made a circuit of the church, from a confessional to the back to the Lady Chapel and finishing beneath the Advent wreath. All this came through in Green Mountain’s broadly conceived interpretation, equal parts reverence and rapture. My one quibble concerned the failure of the massed voices to register clearly against the instruments — the words seemed to dissipate in St. Paul’s reverberant ambience. There was no failure of enunciation; the more intimate singing in the motets was crystalline. Jason McStoots, with closed book, was a particular joy in “Nigra sum” (“I am dark but comely”), embracing every consonant and giving sensuous point to “The king . . . led me into his chamber.” Sopranos Greenleaf and Molly Quinn were piercing but not shrill in “Pulchra es”; tenor Sumner Thompson was languidly robust in “Audi coelum”; and alto Virginia Warnken was radiant in the “Virgo singularis” verse of the “Ave maris stella.” The performance built to the expanding universe that is the opening of the Magnificat. Where will Green Mountain Project expand to next year?